Meditation has many proven benefits, but perhaps the most important of all is it allows us to spend quiet time with the divine inside us. Strengthening this connection strengthens everything. When you meditate consistently, you rewire the neural pathways of your brain among a myriad of other health benefits. With the Gaia Wisdom Meditation Immersions, you receive all the health benefits of a consistent practice as well as deepening and strengthening your connection to the spirit realms, your higher self, and to the inner beloved. What is a Guided Meditation Immersion? We have compiled a Meditation Immersion that includes between 12-14 guided journeys which follow the course of a common theme. You will receive a new guided meditation every three days for approximately 36 days. Included with the meditation are “Tools for Practice” which will give you an exercise to expand the theme of the guided meditation. Each Immersion follows an arc – a beginning, middle, and completion. This sequence, coupled with the consistency and duration will instill a practice for you to begin embodying and witnessing profound shifts in your outer world. As a child, meditation seemed secondary to breathing. Although at the age of ten there wasn’t a word in her vocabulary for the connection she would make to the natural world around her. Dakota has lived and walked a spiritual, shamanic path and has infused it with her soul calling and life work. As a teacher of Shamanic Studies, Dakota’s teachings are nearly always supported by the guided meditations she creates. Currently, Dakota has over 20,000 followers and 1.5 million plays between the three platforms where people find her meditations. She has recorded over 130 guided journeys, each one diving into an area of the soul to gain growth and empowerment. As a Shamanic Teacher, a Meditation Coach, and as a fellow Soul Traveler, Dakota brings all of her life experience, acquired skills, training, and passion to the body of work she creates. In the North Direction, we work with our Spirit Guides to plan what seeds we want to plant while in the East Direction. How do we want our life to look? What do we want to attract? In this guided meditation, we explore with our Guides what is in our highest interest. In this guided meditation, Dakota takes you through the Sacred Wheel to examine the various parts of your life where you can add to, release, or transform to live a more soul-filled life. This guided meditation is to help you access where you are in your life and to manifest the life, we most wish for. You’ll go through the various areas of your life, see what changes need to be made, and what you would need to do to be living into your highest potential. Sometimes we get immersed in our ego and not enough in our soul. In today’s journey, we consciously move out of our ego and more into the innate wisdom, and unconditional love which is found in our heart space, the place where we connect to our soul. In this guided meditation, we visit our sacred purpose and how that might show up in our lives and how we can begin embodying our sacred purpose into every aspect of our life. We work in the East direction, a time of working with our dreams, ideas, clarity, and perspective. With this powerful energy of the East, we can put action into fulfilling this sacred purpose. In this journey, we go to the depths to transcend the ego that binds us to the 3D world. In doing so, we free ourselves of our limitations and blocks. In today’s journey, we explore the word of music and open the heart through the vibrations of the Solfeggio frequencies, 432 Hz and by using the Schumann Resonance. Using a conscious connection to specific words is what I have termed the Living Soul Words. To take a word and create a tangible landscape for it to seed and fruit within your subtle body layers is a way of transforming any negative language into something more awakened and conscious. In this journey, we work with these living soul words and the Shaman Mantras to integrate them fully into our beingness. Take a journey into the sacred space of your heart and step into a more open, passionate, and vital heart space which allows you to open to life more easily and authentically. In this journey, we travel to the middle world and meet with our Spirit Guide and learn the lessons of this past year as well as look towards the future and what is ahead for us. A vision quest is a time to reflect, go within, and find the clarity that we cannot always find in our everyday life. It is a time to seek the answers we need to find our path. In today’s guided meditation we go on a virtue, imagined vision quest out in the wilderness. We work with the elements, our guides, our emotions and more. This guided meditation is one you can use daily or weekly when seeking clarity, answers, or understanding surrounding a specific intention or question you have. Dakota leads you to open the heart space, inviting your spirit guides in, setting your intention or question and receiving the guidance your guides have for you. 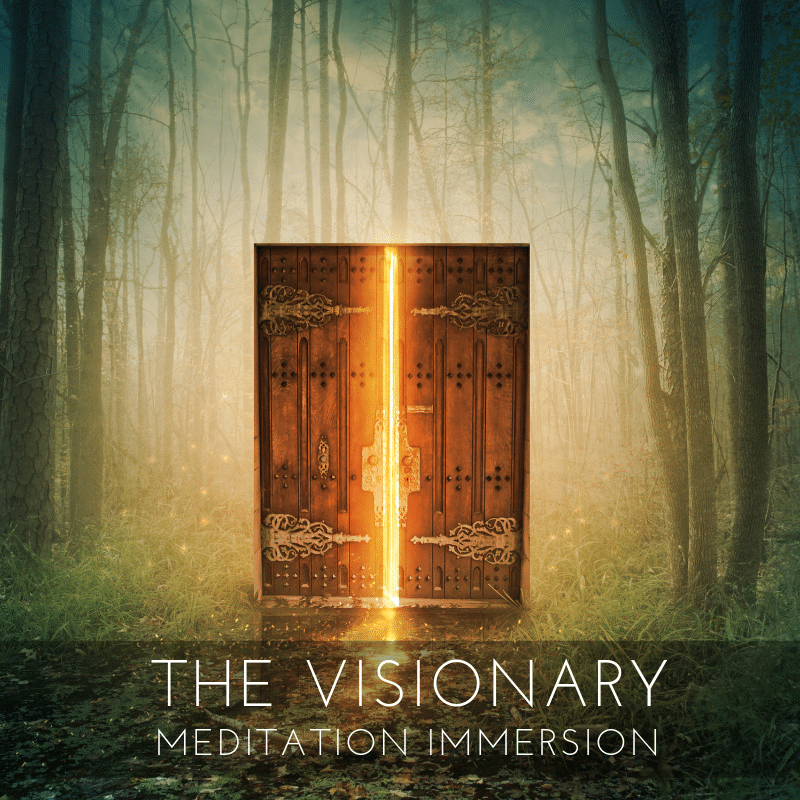 The Visionary Immersion: Take a deep dive into the Visionary Soul Archetype in this meditative journey through the East Direction. We will follow the sequence of Truth, finding the truth which resides deep within your soul and exploring the path towards your sacred purpose. We’ll next enter the realm of Vibration and find ways to reconnect to our purpose. And finally, Perspective, which gives the space needed for integration, and clarity to begin nurturing the dream. In this journey, you will travel to the three worlds of non-ordinary reality and shapeshift into various forms of water to cleanse, balance, and open your chakras. Sometimes we lose our power, and it leaves us disconnected. In today’s journey, we reconnect to our divine essence and tap back into that universal flow of energy and empowerment. We empower ourselves to step back into our full divinity and become who we are meant to be. Anger, when expressed healthily, can be a tremendous ally and teacher for us. Anger that is internalized or turns to rage or expressed in an unhealthy way can be detrimental to us – and others. In today’s guided meditation, Dakota takes you through the energy of anger and helps you to transmute it into a resourceful, and powerful ally. We each seek love at its most pure and deep state. In this guided meditation, we will call upon Archangel Sophia, the angel of love, to help guide us to the Higher Soul of our soul mate. Be shown how to navigate through any blocks that might keep you from experiencing this love, and spend time connecting to this love of your soul. This journey takes you into a world of self-discovery, finding those parts of ourselves that are beautiful, magnificent, and worthy of our love. Inner Beloved is about falling in love with the spirit of who you are. When our Soul is born, it splits into two, creating two souls who will traverse time and space, each one on their path. Often, they are complete opposites to make a complete whole. And when the time is right, these two halves come together. In today’s journey, we go to the spirit plane to meet our twin soul. This journey takes you through a moving, invigorating and beautiful dance between the sacred masculine and the divine feminine which we each embody. In this chakra aligned journey, we travel through the chakras, waking up both energies and marrying them within each chakra. Travel through tribal beats of the root chakra, the sensual sounds of the sacral, the powerful notes of the solar plexus, the heart opening sounds and rising into the remaining chakras giving voice to the masculine and feminine energies. Once the third eye is activated, we can then reconnect these energies to the spiritual realm through the crown chakra. This is a powerful journey. Igniting the fire in our belly helps us to tap back into our intuition, our creativity, and our vibrancy. We ignite the inner flame that propels us forward and also deeper, it awakens the senses and gives us a breath of fresh air into our sometimes-stagnant life. In this moving meditation, we focus on the opening, releasing, and balancing of the Root Chakra (Earth) and our Sacral Chakra (Water). The piece moves through music and gentle guidance as we discover and uncover the kaleidoscope of energy housed in these two chakras. For the best use of this journey allow yourself to be in a private, safe space where you can freely move and dance. Play the music as loud as you are able, use a blindfold to immerse yourself in the experience and after the journey, create a piece of art depicting your experience. In today’s journey, we use Shamanic Breathwork to ignite our inner fire. We work on the Solar Plexus and Sacral chakras today, waking up our power and our intuition. When we love unconditionally, we give ourselves the gift of freedom. We view the world around us from the perspective of our higher self and can attract into our life all that is beautiful and deep, and connected. In this guided meditation, we open the heart to allow ourselves to step fully into unconditional love – both by giving and receiving. Take a journey into the center of our earth, using the Schumann Resonance and the sounds of Mother Earth as we reconnect with her deeply and profoundly. This guided meditation utilizes the power of vibration, frequencies, powerful breathwork and more. Return to the innocence of your childhood, seeing your world through the fearless eyes you once had. During this journey, you will commune with the helping spirits of your guides, animals of the forest, and spirit guides as you uncover those lost dreams you had while growing up and tap into that joy of playfulness. 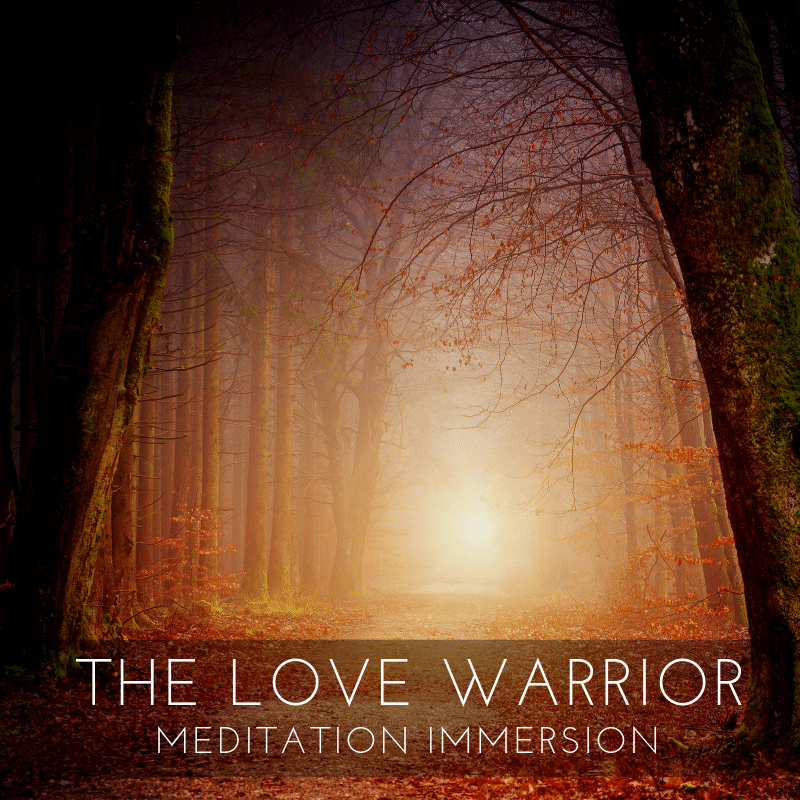 The Love Warrior Immersion – This Immersion has three “overtures” as we begin our journey into the South Direction with unearthing our Emotions through an exploration of our emotional body. We then move into the Relationship phase where we dive into the inner beloved and what we hold sacred. We end our journey by looking from a new Waking Up about our lives and how we go forward into living a heart-centered life. In the West Direction, we witness the harvest from all that we planted while in the East direction. We take stock and transform anything which no longer serves us. In this guided meditation, we witness all those things we harvest and sift through all that we want to keep, and that we want to let go. In this guided meditation we travel to the Upper World and receive wisdom and a gift from our Spirit Guide. We then will co-create an altar together in the ethereal world where we can revisit time and time to receive healing, work with our guides, or commune with our soul family. Forgiveness is a transformer for your heart space and your life. It is a powerful soul tool that enables us to move forward on our soul path. In this guided meditation, we go through the act and the heart opening of forgiving someone who has wronged us in the past. When we have experienced trauma in our lives, we lost pieces of our soul. Over time, all these missing pieces begin to dull our life, and we lost touch with who we truly are. In this guided meditation we go to find parts of our soul that are ready to come home. During this journey, we travel to the Otherworld to commune with the spirits of our ancestors and those who have passed before us. This is a time to reconnect, to forgive, find closure, and heal old wounds. During Samhain, the veil between the worlds is very thin, allowing spirits to pass from one world to the other with ease. In this journey, we travel to the upper world to meet with our ancestors. With an open heart, full of love and compassion, we help them to release the traumas and stuck energies which help to free both them and us. In this guided meditation we confront our shadow sides and rise up the Warrior within us. You may also download the worksheet that will help you in this journey. It would be best if you fill out the worksheet before the journey. Fear can paralyze us and keep us from stepping into our power. In this guided meditation we take those fears and face them one by one and transform them into faith – faith in ourselves, in humanity and our Sacred Purpose. 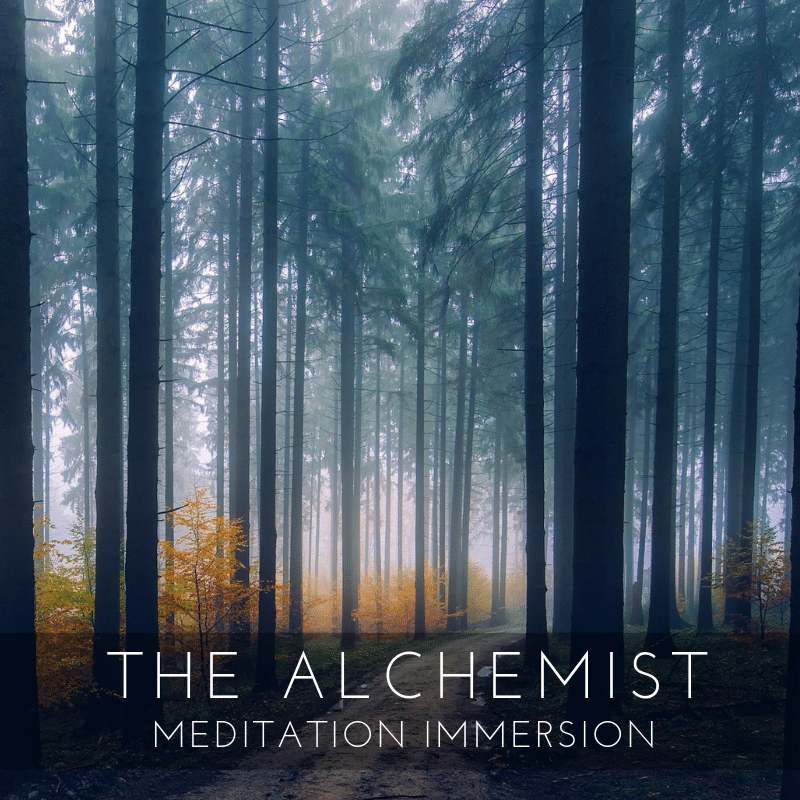 The Alchemist Immersion – This immersion takes you through a series of guided meditations, soul-inspired exercises, and insights to assist you in deep transformations, gratitude, forgiveness, and more. You will learn to work with your ancestors, retrieve parts of your lost soul and dive into a world of alchemy, manifestation, and abundance. This Immersion follows the three sequences of Excavation, Recovery, and the Rise. In the North Direction, we retreat inward, to reconnect to our spiritual team and our soul. In today’s journey, we go inward and tap back into the wisdom that sits at the seat of our soul. Deepen your experience by purchasing our other track “Dance Your Power Animal” to help you to embody and connect with this beautiful and helping spirit fully. In this guided meditation, Dakota takes you through a process of channeling the messages of your divinity, or Higher Self. You’ll be led through a series of questions which you will hand write a response to, allowing you to access that inner wisdom that resides within you. This is an active meditation so you will need a pen, paper and to create sacred space before the meditation. Create a space on your altar for this part of yourself so that you are reminded of this integration. Our outer world will always reflect our inner world and vice versa. 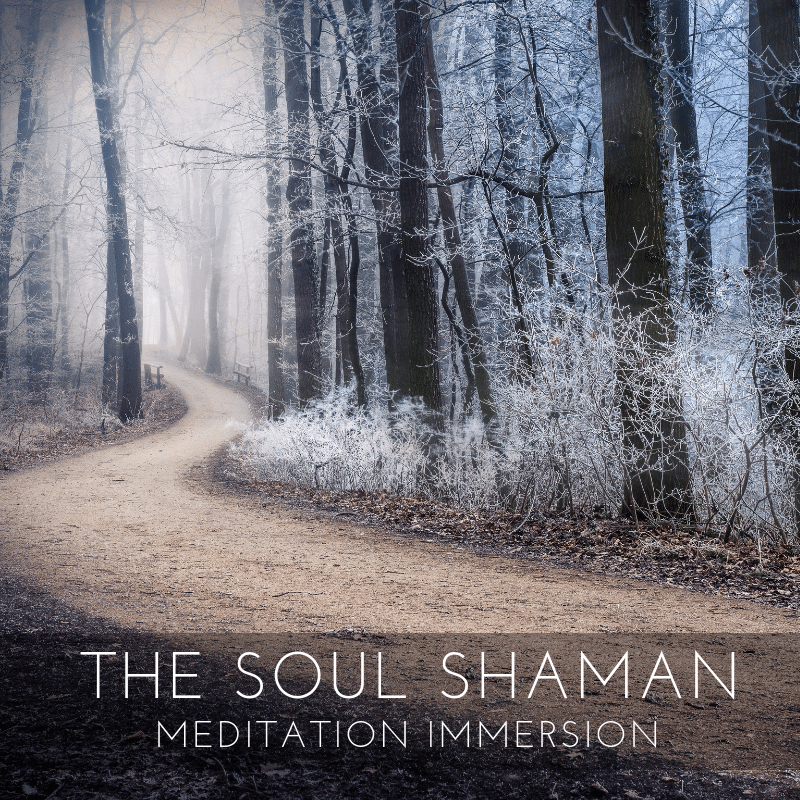 In this guided meditation we open the shaman within us, and we work inwardly by looking at the shadow sides of ourselves, we embrace the light and the dark and make the changes needed to create the world we most want. Our higher self is the part of us which is always connected, always tapped into the Source of all. This is the part of us that resides outside of ego and utilizes wisdom based out of love and compassion. By tapping back into this side, we open our hearts even wider. In this guided meditation we do just that, we take a journey to reconnect. In the moments just before death, are their regrets? Are their profound messages to urge you to live differently? Is there a moment of connection that is needed to pass peacefully? In this guided meditation we connect to our breath, that given gift we sometimes take for granted and while journeying through a beautiful forest at the guidance of a spirit bird, we enter a sacred space and ask those very questions to our future self, moments before our passing from this incarnation and back to our soul family. Hear what messages this part of you has for you now and use these moments for deep clarity in the way you presently live. In this guided meditation, we visit our Soul Book, akin to the Akashic records; this is the record of our soul since the beginning of our souls’ incarnation. Here we can view and learn from the history of our soul. We’ll set the intention of finding clarity on something we are working through at this time. Shapeshifting is a powerful tool for understanding the energy of another being, and for receiving the wisdom, they can impart. In this guided meditation we utilize the power of our breath to clear our chakras one by one before traveling to the lower world where we will shapeshift into an animal spirit being. Time is an illusion, a construct that we have created in the 3rd dimension. In today’s journey, we bend time so that we can be a witness to the past, and future, all in the present moment. From this place, we can understand the role we have played throughout time. In this journey, we travel back into time through the powerful portal of the Standing Stones, to a time and place that our soul wants or needs to revisit. With my own magical experiences with Callanish Standing Stones and with my recent obsession with the TV show, Outlander, both serve as the muse for today’s journey. In this guided meditation, we take an assessment of our life – who we are, what we love, what changes we need to make, etc. Taking a walk-through nature to ponder these questions gives us the needed integration and resources to be able to find the answers we seek. This journey helps you to clear out the old and make room for the new. The Soul Shaman Immersion: This immersion takes you deep within the core of your being and allows you to find your way back to the spiritual realms to work with your spirit guides, ancestors and to experience shape-shifting and astral travel. We’ll use breathwork, and trance as our primary mode of transportation. In this Immersion, you will experience the three sequences of Connecting, Within, and Time.